This week, we discovered Bubble Guppies. You know those moments where you come bundling through the front door from the cold and there’s a frenzy of activity to uncork children from bobble hats, unzip coats and try and get shoes off all at the same time? Well it was in exactly this kind of moment of hallway madness that I sat two year old Primo down in front of the babysitter in the corner (television) and stuck the Peppa Pig channel on while I flicked the kettle on and ran upstairs for a wee. Except Peppa Pig wasn’t on. It was Bubble Guppies. Now, I’m a reasonably intelligent adult and I know what a bubble is and what a guppy is, but this is lost on me. From what I can fathom, we’ve got children with fish tails who float through not only the sea but also the air, and in fact can drive Land Rovers on safari. Because of course they can. 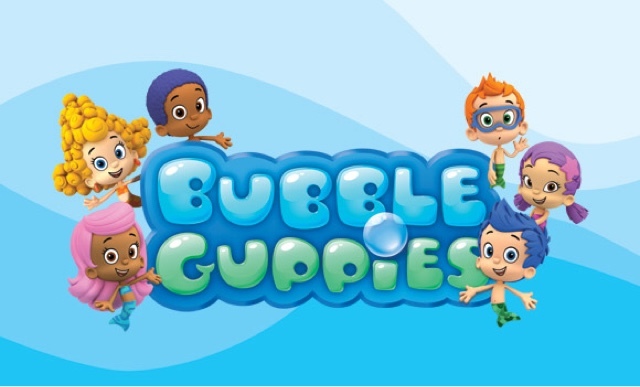 Primo’s favourite has blue hair and a green tail but I can’t really tell the difference between any of them and the only redeeming feature of Bubble Guppies for me is the catchy opening theme which I think should be about six times longer, and the actual content about six times shorter. It’s one of those American/Canadian animated series like Paw Patrol dubbed over in the same kind of English/Transatlantic accents. In fact, I’m pretty sure I heard Captain Turbot when I was walking in and out of the living room, trying to find something to do that would help me avoid watching Bubble Guppies. In fairness, they do have some pretty good preschool level learning/interaction content, probably a bit gentler than some of the STEM topics in Blaze and the Monster Machines, but I remain unconvinced at least for now. Anyway as it turned out, when Bubble Guppies finished and Peppa Pig finally started, Primo was most upset and I ended up downloading loads of episodes off Nick Jr so now I’m stuck with these little squeaky voiced mermaid brats for the foreseeable future.